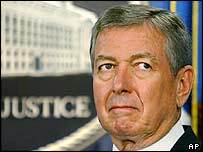 US Attorney General John Ashcroft has resigned from the Bush cabinet, the White House has announced. 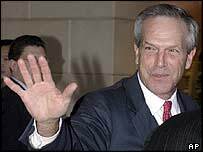 Commerce Secretary Don Evans, a close Bush friend, has also quit his post. They are the first departures from President Bush's cabinet since he was re-elected for another four-year term last Tuesday. Mr Ashcroft, in a letter announcing his departure, said the objective of securing the safety of Americans from crime and terror had been achieved. Correspondents in Washington say further cabinet changes are expected as President Bush prepares for his second term. The BBC's Ian Pannell, in Washington, said neither announcement came as a surprise to Washington insiders. Mr Ashcroft, who has been a lightning-rod for criticism in the administration, wrote in a five-page handwritten letter to Mr Bush that "the objective of securing the safety of Americans from crime and terror has been achieved". "Yet I believe that the Department of Justice would be well served by new leadership and fresh inspiration," said Mr Ashcroft. Meanwhile, Mr Evans wrote to the president that "while the promise of your second term shines bright, I have concluded with deep regret that it is time for me to return home". Both Mr Ashcroft, 62, and Mr Evans, 58, have served in the Bush cabinet from the start of the administration in 2000. Mr Ashcroft helped to lead the US war against terror after the 11 September 2001 attacks. He drew up the Patriot Act, which gave the FBI and other agencies powers to tap phones, access private medical and library records, track internet usage and detain immigrants. The president has responded by saying that he appreciated their service. There will now be a process of looking for replacements, with suggestions that the administration will be looking to make the appointments as soon as possible, our correspondent says.